Date nights are your opportunity to escape the mundane and enjoy a few hours of fun and relaxation with your significant other. 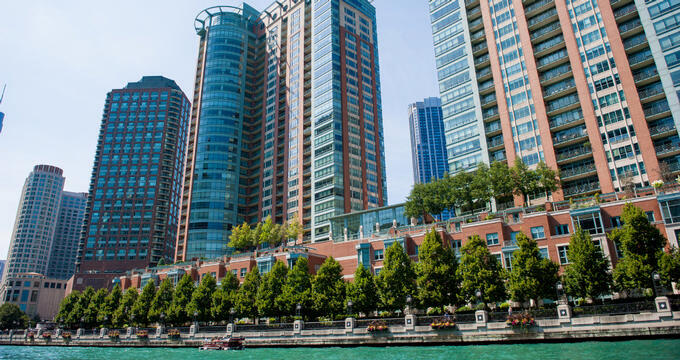 Chicago offers an endless selection of great places to visit for that special date occasion, ranging from laid-back craft beer taprooms, family-run pizzerias and Asian take-outs to sophisticated top-end dining experiences. For a date with a difference, take your partner to have some fun at The Safehouse, a delightfully quirky spy-themed restaurant, night-club and secret-service hang-out. Visitors will first have to find the well-concealed “secret” entrance and pass a clearance test before they can enter and start their “mission” in the Gadget Bar. Expect secret passages, hidden doors, great cocktails and a lot of fun. Of course, Spies need to eat and you can also enjoy a great meal at The Safehouse – get a sneak preview of their classified menu on the website. 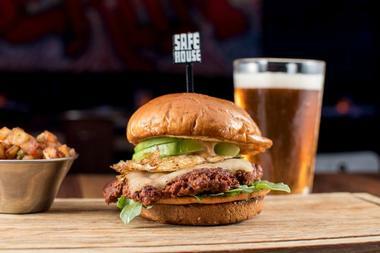 The Safehouse is also a great daytime venue for Play Dates with the kids – special junior spy missions can be accomplished while the kids wait for their meal. Located in Wicker Park, Rhyme or Reason is an interesting 70’s style gastro pub – the ideal place for a touch of nostalgia on date night. 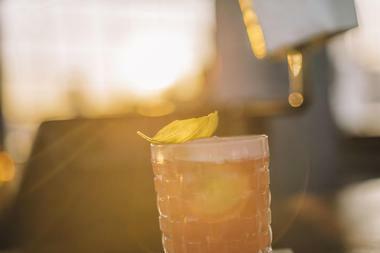 The restaurant has a slightly retro-style menu which features several old favorites and a long list of innovative cocktails named after disco hits. Rhyme or Reason hosts a popular happy hour from 5 – 8pm (Tuesday to Friday) when you and your date can enjoy a variety of specials and listen to live music or the DJ’s choice of vinyls. On Saturday and Sunday you can enjoy a laid-back brunch served from 10.30am or come in later for the regular dinner menu. 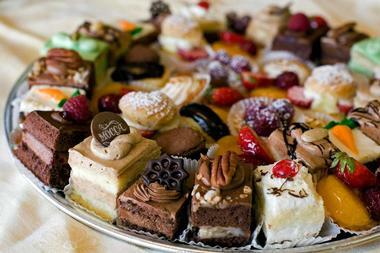 If you or your date has a sweet tooth you will find Delightful Pastries really hard to resist. This European-inspired bakery uses only the freshest locally-sourced products to produce their large range of delicious cakes, pastries, doughnuts and much more. The delicious range is made using pure butter, reduced amounts of sugar and absolutely no trace of any artificial flavorings or preservatives – gluten-free options are also available. Why not stop by and get some of your favorite delights to take home and surprise the love of your life. In addition to mouth-watering sweet treats the bakery also makes some delicious savory dishes which you can enjoy at home on a cozy stay-in date night. You can be certain to add some fire and spice to your next date night when you book a table at Carbon Live-Fire Mexican Grill. The restaurant is rumored to serve the best tacos and burritos north of Mexico and prides itself on using only the best quality, healthiest and freshest ingredients, all cooked to perfection on site. There are vegetarian options available and the pineapple salsa is sure to be a hit. If you are thinking of having a girl’s (or boy’s) night in, you can order on-line and Carbon Mex will deliver all their taste sensations to your door. The restaurant has two locations for you to choose from. 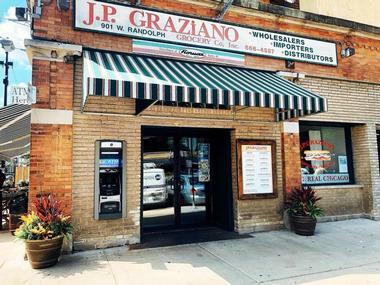 You can never go wrong with great Italian food so why not elevate your next office lunch to date status by ordering a couple of legendary subs for you and your partner from J P Graziano. This family-owned fourth-generation Italian grocer has been pleasing Chicago palates since 1937 and there is no doubt that your order-in lunch will be a hit. You don’t have to restrict yourself to their famous subs, you can also choose from a variety of tasty antipasti platters, desserts and more. If you want to take things a step further you can order a selection of their imported Italian delicacies to prepare at home to surprise your date. 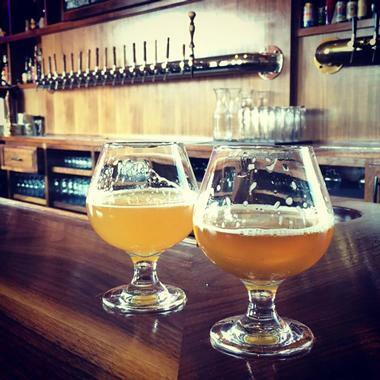 The craft beer phenomenon has taken America by storm and Chicago is no exception. 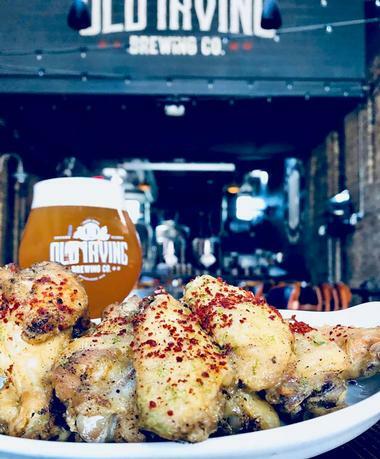 A great idea for a relaxed date night is to spend a couple of hours tasting some innovative and delicious craft beers at Old Irving Brewing Company. The brew-pub directly overlooks the brewery so that you can watch your favorite beer “under construction” while you taste and eat. They offer a great menu to enjoy alongside your craft beer including salads, platters for the table, delicious main courses and weekly specials. Just in case you are not a beer enthusiast there is also an extensive cocktail, cider and spirits menu. Links Taproom is more than just a place to taste craft-beer it is also an ideal place to take someone special for a fun and tasty date-night. The taproom serves a wide variety of craft beers (36 on tap) and serves up some great American comfort food including a variety of home-made sausages served with all the trimmings. 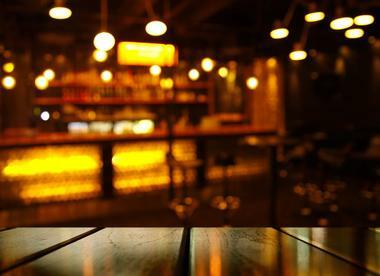 In case either you or your date is not a craft beer enthusiast, you will also find a selection of wines served by the glass as well as a deliciously tempting cocktail menu. 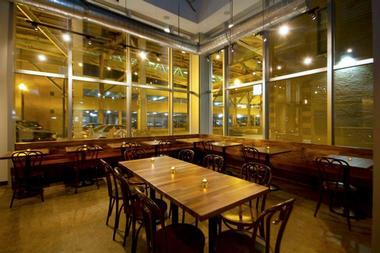 Links Taproom is open seven days a week – ideal for a fun and spontaneous date. 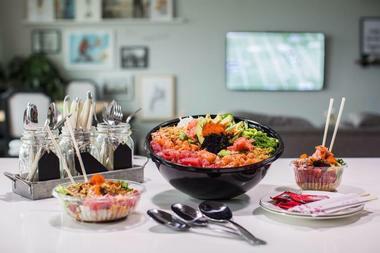 If you and your date are serious health-nuts (or maybe you just love eating the freshest, tastiest and healthiest raw foods), you need to check out the Aloha Poke Company, which has several outlets dotted around Chicago. Although this is not a date destination in the real sense of the word (take-out only) you will get your stay-at-home date off to a flying start when you arrive with a selection of utterly delicious poke bowls featuring the freshest tuna and salmon, together with your choice of chopped vegetables and the most flavorsome sauces this side of Hawaii. Vegetarians can choose to leave out the fish and enjoy their poke bowl with tofu instead. For that special date night, when only the best will do, Maple and Ash is the place to go for outstanding food and wine served in an elegant and sophisticated setting. The man in charge of presenting an ever-changing menu of delectable authentic wood-fired dishes has two Michelin stars to his name and the sommelier gathers together an outstanding range of wines from all over the world. As you can imagine, dinner at Maple and Ash is more of an experience than just a simple meal out. The extensive menu includes succulent meats, an extravagant selection of fish and seafood and three different types of caviar. If you have difficulty deciding what to order you can leave it to the chef to decide for you. If you are trying to come up with a novel idea for your next date night, why not consider a craft beer lesson at the Craft Beer Temple. You and your date can learn all about what makes a craft beer great, find out how to tell Ale from Lager and enjoy tasting some of the large selection of craft beers available in the Taproom. If beer lessons do not appeal to you then just come along to the Taproom to enjoy some of the delicious hand-crafted beers available on tap or from the bottle shop. Craft Beer Temple is open seven days a week. Get your date off to the sweetest possible start by planning breakfast at the only authentic Dutch pancake house in Chicago. 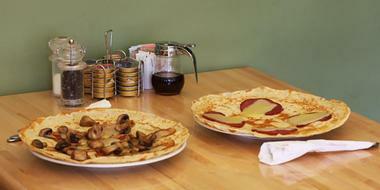 The Pannenkoeken Café is a tiny Lincoln Square landmark which has been delighting Chicago palates with the most delicious selection of crispy-edged Dutch pancakes and other delights since 2007. In addition to a selection of sweet pancakes, you and your date can sample some of their delicious savory pancakes – a complete breakfast or brunch to set you up for the day. They also serve traditional egg dishes – their French toast with blueberries and Mascarpone is rumored to be unbeatable. For your next big date night consider tantalizing your taste buds with one of the seriously delicious meals from Umami Burger. The restaurant specializes in presenting perfectly cooked dishes with a distinct WOW factor, using the delicious earthiness of bold and savory Umami flavors. Expect miso mayo, yuzu yoghurt, miso ketchup and truffle to find their way onto your plate to elevate your meal to another level. Along with your delicious meal you and your date can enjoy a wide range of beers, wines, ciders and spirits. 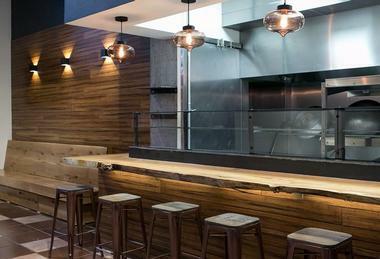 With two branches of Umami Burger to choose from you have no excuse to miss this taste sensation. Turn your next date night into a palate-pleasing taste sensation by booking a table at Giant Restaurant where Chef Jason Vincent is serving up delicious innovative dishes in an intimate 45-seater dining room. The food focuses on fresh delicious menu favorites which include freshly-made pastas, crab with waffle fries, delicious short rib and Thai spice corn with peanuts. There is a good selection of craft bears and wines as well as an interesting cocktail menu. The atmosphere is comfortably laid-back and the fact that you need to book your table well in advance is evidence of the little restaurant’s popularity. Open Tuesdays to Saturday. 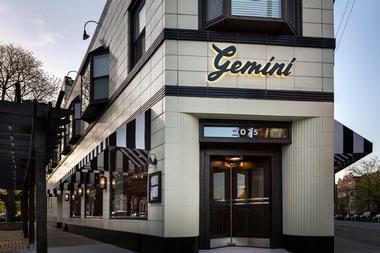 Conveniently located in the center of Lincoln Park, Gemini is an ideal restaurant choice where you and your date can enjoy a warm welcome and a made-from-scratch heart-warming American meal. The ambiance is casual and laid-back and there is a great U-shaped bar at the heart of the restaurant where you can enjoy a cocktail before your dinner. 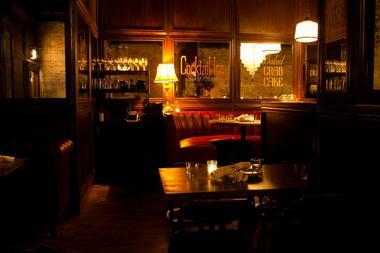 The restaurant is open five days a week for dinner and offers a great weekend brunch menu on Saturday and Sunday. You will find something to please even the pickiest palate on their extensive dinner and brunch menus including vegetarian and gluten-free options. 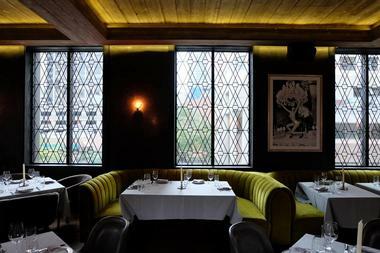 Red leather couches, wood paneling, stylish chandeliers and lively jazz set the scene at Bavette’s Steakhouse and Bar. This French-inspired take on a traditional American steak house restaurant offers the ideal ambiance for a date night and you can look forward to spending a relaxed evening enjoying delicious steak-house favorites. The menu features starters, fresh oysters, sea-food towers and platters, a variety of aged steaks and a good selection of side dishes. You can wash it down with your choice from an extensive drinks menu featuring wines, beers, and whiskeys from around the world as well classic cocktails and lots of bubbly. 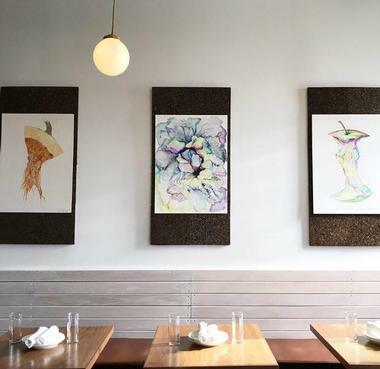 If you are looking for exciting flavors and a touch of spice to liven up your next date night without breaking the budget, Saison Sisters is the place to go. This authentic Vietnamese restaurant offers a great selection of Vietnamese favorites like Bahn Mi (sandwiches with all kinds of intriguing eastern flavors), Bahn Bao (open steamed buns filled with various flavorsome meats and poultry, fragrant noodle and protein bowls and the ever-popular Pho (noodle soup with various delicious additions). The dinner menu features more substantial mains like whole Vietnamese-style fish and beef tenderloin. 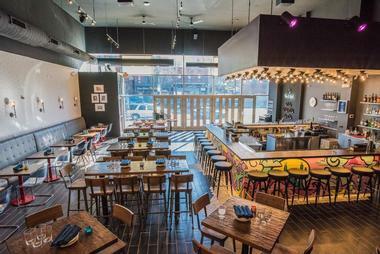 The Lake Street venue offers a good drinks menu including wines, beers and cocktails. 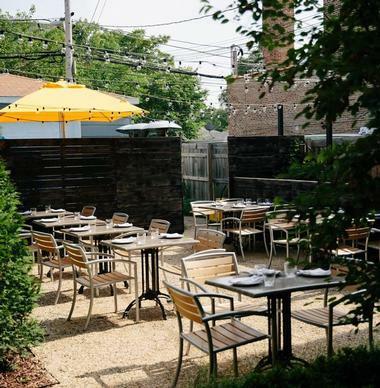 Daisies is located on Logan Square where executive chef Joe Frillman offers a delightfully pasta-driven menu, highlighting fresh locally produced vegetables to tantalize your taste buds. Daisies is the ideal date-night restaurant for both vegetarians and healthy food enthusiasts and non-veggies are also catered for with a few rotating meat-based creations. All the pasta is hand-made on site and the fresher-than-fresh veggies come from the family farm. The restaurant is open for dinner from Wednesday to Sunday and brunch is available on Sundays. 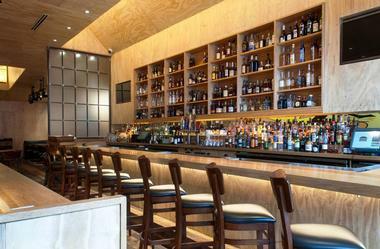 There is a good selection of spirits, beers and wines to enjoy alongside your meal. You can make a date with six or more of your closest friends to enjoy a sensational group tasting menu. 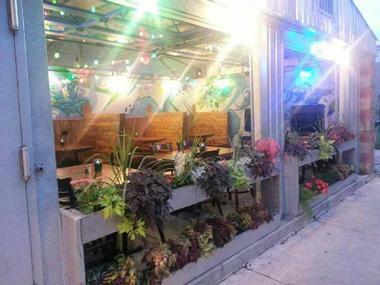 Located in Chicago’s West Loop neighborhood, Bang Chop Thai is an ideal casual eatery where you and your date can enjoy freshly made traditional Thai food without blowing your budget. (You are also welcome to bring your own wine or beer to the venue). The restaurant offers a very pleasant ambiance featuring Asian artwork and an open kitchen so that you can watch the team at work. The menu includes several wok-fried noodle dishes, favorites like Pad Thai and some delicious fresh and flavorsome Thai salads. If you want to surprise your date with a fantastic Thai/Vietnamese dinner at home you can order your food online from both Bang Chop Thai Kitchen and their sister-brand, Saigon Sisters. Pizza lovers need look no further than Lou Malnati’s original deep-dish pizzeria in Lincolnwood for a great date night supper. 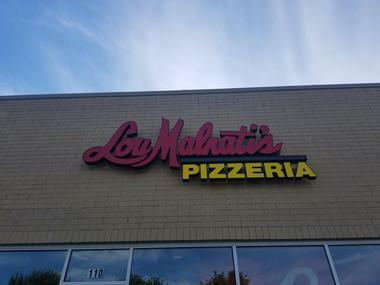 The Lincolnwood venue is where Lou opening his first Pizzeria but the family-owned restaurant and take-out chain now own over 50 locations in Chicago so you are bound to find one in your area. The menu features a core selection of popular pizzas which can be personalized by the addition of a large list of extras, and there are also options for thin-crust pizzas and gluten-free bases. If you are not in the mood for a pizza you can choose a soup, salad, pasta or sandwich. If you would like to try something a little different on your next date night you can make your way to Tapster, where you and your date can update your wine, craft beer and cocktail knowledge and learn how to pour the perfect pint. Tapster takes its name from the old English word used to describe a barman and turns the entire concept upside down. 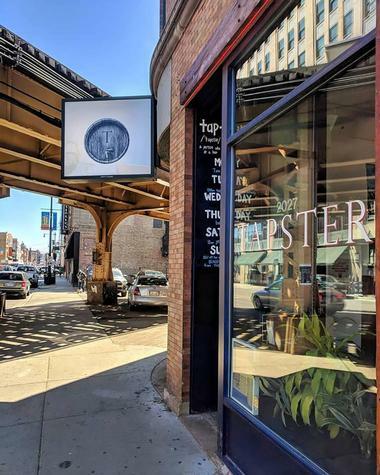 At Tapster you will not have to wait behind the bar to be served – you simply walk up to the expansive Tap Wall of over 40 self-serve drink taps and become your own tapster. You can try samples of each of the drinks on tap without committing to a full portion – an ideal way to improve your wine and craft beer knowledge. (Non alcoholic taps also available). When date night warrants a great ambiance coupled with an innovative menu, The Albert could be exactly what you are looking for. 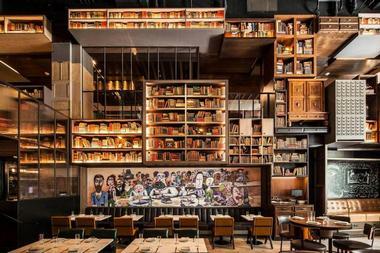 The décor is comfortably inviting featuring walls of books and lots of wood and art. The menu sounds deceptively simple and does not quite prepare you for the beautifully crafted dishes you will be presented with. There are always vegetarian options to choose from and if your appetite or budget is not up to a full dinner you can still enjoy some delicious food from the bar menu or visit during Happy Hour from 3pm to 6pm for discounted drinks and nibbles. The University of Chicago Pub is located right on the campus in the basement of Ida Noyes Hall. The Pub is operated as a Private Club and you and your date will only be able to visit if one of you is a present or past student, a staff member or you are accompanied by one of the above. The Pub offers a large variety of craft beers on tap as well as a tasty menu of bar snacks, burgers, sandwiches, hot dogs and tacos/burritos. The atmosphere is lively and there are fun bar games and board games available. The Pub is open from Monday to Saturday only during the academic quarters. Located on the Loyola University of Chicago’s Lakeshore Campus, Ireland’s Pub 10 is named after George Ireland, who led Loyola to basketball victory in 1963. Pub 10 is managed by the students and is open to everyone – the lively atmosphere makes this an ideal place to bring a date to taste some local craft beers or simply hang out and enjoy some good coffee. If you would like to learn more about the craft beer phenomenon you can join one of their twice-monthly Tap Takeovers, when local brewers are invited to come and present talks about craft brewing. Pub 10 offers daily specials and you can order in Panini’s and Pizzas from Felice’s Kitchen. 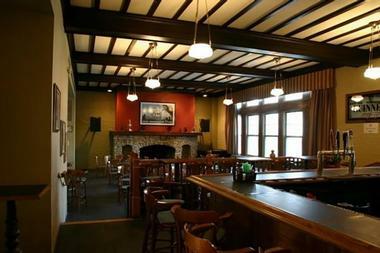 The traditional Irish Pub style of the Fifth Province pub in the Irish American Heritage Center makes Fifth Province a great choice for a date night. The pub was originally founded as a community gathering place for Irish immigrants (Chicago is referred to as the fifth province of Ireland) and today it is probably the most popular Irish Pub in Chicago. Visit on the weekends to enjoy live Irish music as you enjoy some traditional Irish Pub fare washed down with a Guinness or two. The Heritage Center has an Irish Fest every year in July when you can enjoy several days of great Irish food, culture and music.